While it’s highly tempting to say “good riddance” to Formula One’s infamous loose cannon autocrat-gnome Bernie Ecclestone, we probably wouldn’t be arguing about F1 at all had he not been there. Ecclestone was instrumental in saving the sport in the 1970s and making it the international business powerhouse it is in the process—no matter who he burned along the way, including the fans. Ecclestone started as a Formula One team owner and driver, having first acquired two F1 cars in 1957. However, it was his leadership of the Formula One Constructors’ Association, or FOCA for short, that led to Ecclestone’s control of the sport as we’ve known it for years. Ecclestone bought the Brabham F1 team in 1971 for $125,037 after a dismal season for the team, per ESPN. From there, he became involved in FOCA. FOCA, which was led by the team principals of non-manufacturer teams Brabham, Lotus, March, McLaren, Williams and Tyrrell, eventually let Ecclestone start negotiating broadcast rights for the sport, according to the BBC. Ecclestone pioneered the practice of selling the rights to entire sport of Formula One to a broadcaster, rather than individual races. This put F1 on television sets across the globe, elevating it from a fading rich-dude pastime to an international phenomenon. Races were easier to find when they were routinely on the same channel, and the sport blew up accordingly. For better or for worse, Ecclestone’s system of negotiating broadcast rights lives on today. 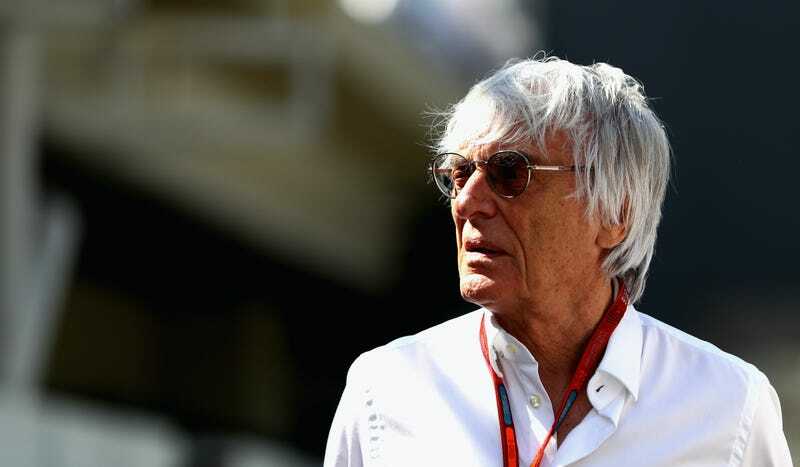 Ecclestone’s keen political maneuvering as head of FOCA led to the teams receiving an annual cut of the broadcast revenue, which they receive in exchange for letting Bernie negotiate broadcast deals on their behalf. However, Ecclestone’s tendency to guard Formula One’s status quo at the top of international motorsport frequently won him enemies out of racing fans who may have otherwise enjoyed F1. His keen politicking to keep F1 on top has been blamed for everything from the demise of Group C sports car racing to the ruinous spin-off of the Indy Racing League from CART. Plus, Ecclestone’s career was filled with controversy away from the track. He never seemed to pass up an opportunity to denigrate women, or to bring up his disdain for democracy, or to pal around with his autocrat buddy Vladimir Putin. He once praised Hitler as someone who was “able to get things done,” without giving a second thought to what those things actually were. He never seemed to care much for where races were held or the fans’ experience, so long as the money kept pouring in. He became synonymous with the sport itself, and that included its failures as well as its successes. More recently, a peculiar bribery scandal surrounded the sale of a 47.2 percent stake in F1 to Ecclestone’s CVC Partners, however, Bernie was able to pay his way out of trouble thanks to a loophole in German law. Bernie kept his power and F1 largely as it has been, however, he looked like more of a comic villain than ever before. It’s become increasingly clear that Ecclestone’s broadcast deals have become out of date, and his attitudes too old-fashioned, controversial and cantankerous to be a credible head of an international racing juggernaut anymore. Formula One is left with much the same issue of relevance and accessibility to fans it had when Bernie rose to power in the 1970s. Fans no longer solely watch sports through television; they also want to consume racing content through online streams, apps like Twitter and Snapchat, and all manner of related digital content. Many also desire to see more cross-overs between series, the likes of which can’t happen when, for example, Formula One guardedly books a race right over the end of the 24 Hours of Le Mans. New F1 owners Liberty Media have placed improving Formula One’s digital presence at the forefront of their plans for the sport. What they’ll need is a group of modern-day Ecclestones—ones more in tune with what fans want today—who are as voracious in seeing F1 rise in prominence as Bernie was in the 1970s and ‘80s.